Note: One of the pitfalls of a plant-based diet is that some foods can soften the enamel on teeth. The acid in citrus can definitely do that, As a reader suggests, the solution is to rinse your mouth with water. And wait an hour or so before brushing. You don’t want to brush enamel that’s been softened. D-limonene, to be precise. Put it in your anti-cancer vocabulary. It’s a member of a very fragrant class of molecules that abound in citrus–terpenoids or terpenes. And they’ve been shown to inhibit cancer cell progression and induce cell death. “This is so refreshing,” says food blogger Holly Botner, downing my homemade “limonade” –lemon juice plus rinds of lemons, limes and oranges soaked in cold water for a few minutes. No sweeteners. And it’s not just the limonene at work here. Another terpene called perillyl alcohol, derived from citrus peel (and from lavender and mint and lemongrass and more), has also demonstrated anti-cancer properties in some studies. The research on these aromatic molecules has been done in several types of cancer cells –including liver, gastric, colon and lymphoma. Structurally some terpenes are similar to human hormones, and some research has shown them effective against breast and prostate cancer cells as well. How do they work? The mechanisms are many, including stimulating production of enzymes that help the liver detox carcinogens and causing cancer cells to differentiate into a more benign version. Naturally, not all the results have been positive and as with most anti-cancer foods, more studies are needed before science can declare them proven to help– or not, but with so much encouraging evidence, what’s the harm in swigging a bit of citrus water all day long? Just make sure the citrus is organic. This entry was posted in Drinks, Fruit, Recipes, Teas and tagged anti cancer dietary strategies, anti-cancer, anti-cancer diet, anti-cancer foods, anti-cancer recipes, cancer prevention, foods that fight cancer, healthy eating, healthy foods by hsugarmill. Bookmark the permalink. You mention not to munch on citrus rind too much or \”it will do a number on your teeth \”. 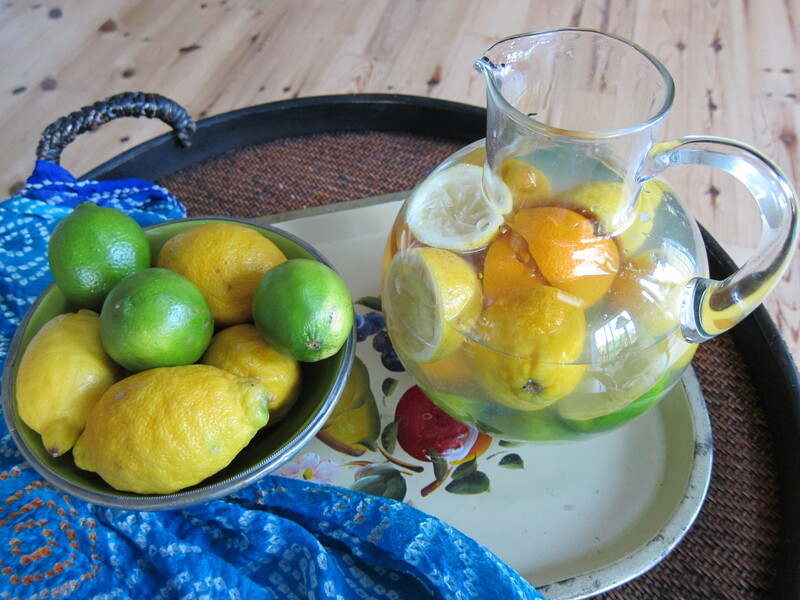 But what about sipping citrus water all day….might this also do a number on your teeth? I’ve been drinking loads of it all summer and haven’t had a problem, but I’ll check it out and let you know. Bathing one’s teeth in acid, whether it is sugar, sugar substitute, or citrus water weakens the enamel, and is ill advised. It would better to drink full glasses followed by some plain water to neutralize the mouth’s ph, especially before biting into anything, or brushing one’s teeth. Thanks, Joe, for your comments. I have read that d-limonene is in the pith as well as the peel but that it’s more difficult to extract from the pith than peel in science experiments. I will double check my sources and get back to you. I’ve also read that it’s highest in fruits at the end of the growth phase when fruits are still green, before they’ve ripened (See http://www.ncbi.nlm.nih.gov/pmc/articles/PMC3329358/). That would make a green lime a better choice than a more yellow lime, which is riper. Try using a straw to drink any liquid that has lemon in it if you are concerned about damage to the teeth enamel. Adding a carrot to the juicing improves the flavor and is very good.